'Kin Bin Hey with KTC'campaign gives members 15% discount at Sukishi restaurants and the chance to win a trip to Korea. Mrs.Pranaya Nithananon, Vice President of Credit Card Business, 'KTC'or Krungthai Card Public Company Limited, and, Miss Rattanawan Jiravaraphan, Assistant Vice President, Sukishi Intergroup Company Limited, offer KTC credit card members the chance to win the most exclusive 5-day, 3-night trip to sightsee and dine in Korea under the “Kin Bin Hey with KTC” campaign. Seven prizes worth 80,000 Baht are offered for two people each. Simply dine 900 Baht at Sukishi and pay with a KTC credit card to be eligible immediately for 5% discount, or, dine for more than 900 Baht and earn 15% discount, provided that the member uses the same amount of Forever Rewards points as the transaction amount and settle for the difference with a KTC credit card. The offer is valid at Sukishi Korean Charcoal Grill, Sukishi Japanese Restaurant, Wawa Taiwan Cuisine. 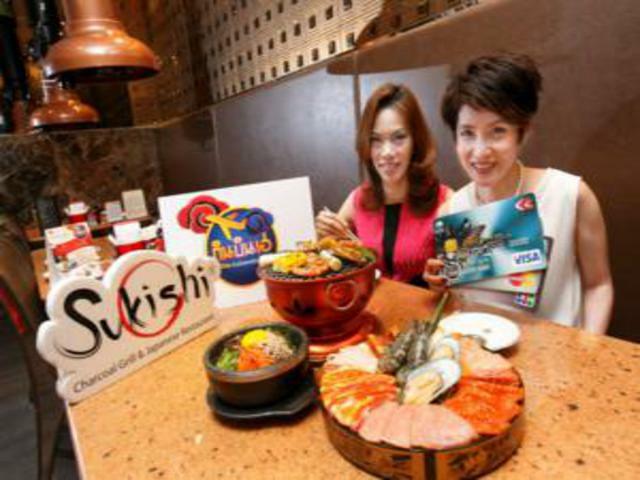 Additionally, members are eligible for the Dine 4, Pay 3 deal from Monday through Friday (except for special holidays) or 10% discount when dining in a group of three or larger on Saturdays and Sundays (regular adult rate only) at Sukishi Buffet, Seoul Grill and Red Kimchi from now until 31 July 2014.